Here are the ratings for the Scandal TV series — the TV show in which a mesmerizing top crisis manager (Kerry Washington) tries to keep big client secrets. The first season of Scandal typically airs Thursday nights at 10pm on the ABC network. These are the TV show’s ratings for the 2011-12 season, the best way to tell if Missing will be cancelled or renewed for a second season. Check out our ABC ratings report card to see how this show’s numbers compare with the others on the network. Final season one averages: 2.0 rating in the 18-49 demographic with 7.02 million total viewers. 2.5 in the demo (+21% episode-to-episode change) with 7.33 million; second in the timeslot. Season average: 2.01 in the demo with 7.02 million. Update: Scandal has been renewed for a second season. 1.9 in the demo (0% episode-to-episode change) with 6.43 million; second in the timeslot. Season average: 1.97 in the demo with 6.97 million. 1.9 in the demo (-5% episode-to-episode change) with 6.69 million; second in the timeslot. Season average: 1.98 in the demo with 7.07 million. 2.0 in the demo (0% episode-to-episode change) with 6.86 million; second in the timeslot. Season average: 2.00 in the demo with 7.17 million. 2.0 in the demo (0% episode-to-episode change) with 7.21 million; first in the timeslot. Season average: 2.00 in the demo with 7.27 million. 2.0 in the demo (0% episode-to-episode change) with 7.28 million; first in the timeslot. Season average: 2.00 in the demo with 7.30 million. 2.0 rating in the 18-49 demographic with 7.33 million total viewers; second in the timeslot. Season average: 2.00 in the demo with 7.33 million. It wasn’t a great start for this new Shonda Rhimes series. It lost 29% of the demo from its Grey’s Anatomy lead-in and essentially only matched the demo of the last original episode of Private Practice in the same timeslot from a month ago. With this debut, it’s already on the bubble. 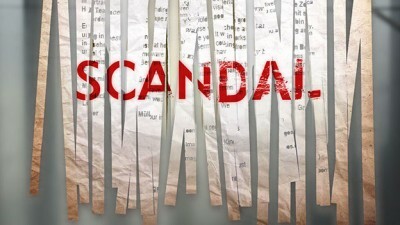 If the Scandal can maintain or build on the premiere, it’s got a good chance at survival. If not, it’ll join the list of ABC’s failed dramas of the 2011-12 season. What do you think? Do you like the Scandal TV series? Do you think it should be cancelled or be renewed for a second season? this is a fun, fast moving drama, and has great writing, and great team of actors! I do hope they keep the show on, its refreshing and nice to have some variety…. Scandal has to be the best all time show I have ever watched. It has both romance and drama. The cast is so awesome. I have not seen a dull episode yet. Why one you think of cancelling such a delightful show. OMG! I Love this show the best one I have watched in a long long time. Look forward to watching every week it holds your attention all the way through. The writer of this series is awesome as are the actors. Hope it stays on. The actors that were picked for their parts fit to a “T”. The show would be better if they would talk a little slower so we know what is going on. If they don’t, then as far as I’m concerned, take it off. I have several friends that say the same. I haven’t watched much TV in the last 3 years with the takover of reality shows. A friend told me about Scandal and I watched an episode and got hooked. This weekend I watched the entire first season on Netflix and had so many OMG moments!!! It’s an awesome show. I hope it stays on. If it doesn’t, I’ll go back to watching CNN and the Food Network…sad commentary…. I Really Like ‘Scandal’!!! Please bring this show back! I found it revieting and kept my attention. Ms. Washington is the best. Her role in this show is very inspiring, by showing excellent leadership. The cast is well blended. Love This Show!!! 2nd Season and More!! I just got into the re-run and ABC need to bring this show back. Kerry Washington and her staff are something awesome. This really is good TV! I watched 4 out of 5 of the episode and could not stop watching it.